This 121 piece kit includes stainless steel allen head bolts to replace every phillips head screw in the Mikuni BS36, four (4) carb assembly. It also contains new metric o-rings for the needle seat assemblies, fuel transfer tubes, idle mixture crews and the intake manifolds. Stainless steel lock washers are included where required. 121 pieces total in the kit. Has everything you need and the price is great!! Thanks for the great stuff RPM! 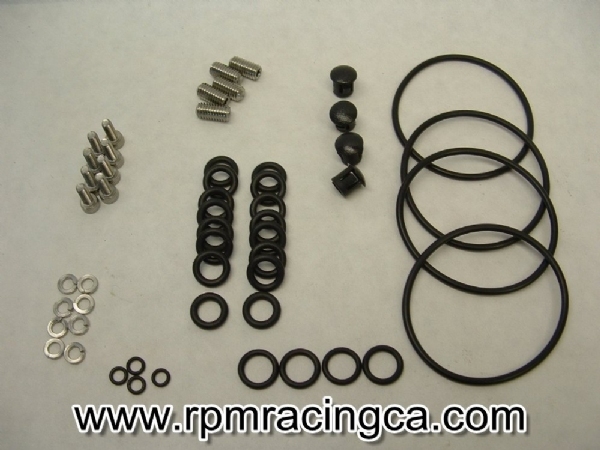 Anyone thinking about about a carb tear down should buy these kits. No more dodgy screws or fuel leaks to worry about ever again. I'm so glad I did this! I bought this kit as a suggestion from Randy and I'm glad I listened. I've had to work on my carbs a few times since and the allen head bolts are so much easier than the soft OEM screws. Just try to source the O rings yourself, this would be a logistical nightmare! Throw in the S/S screws, and the kit is a bargain. If you are planning on doing any kind of work on your carburetors, you NEED this. The OEM phillips screws are soft as butter. Replacing them with stainless steel Allen heads saves you a lot of headache, together with the new rubber o-rings.